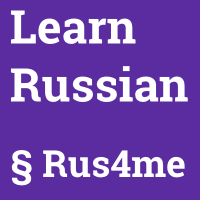 Rus4me (http://rus4.me/) – is a website with Russian language learning materials for intermediate and advanced levels. We thoroughly explain difficult cases of colloquial Russian. Using the original methodology, we analyse modern colloquial speech and choose the most important, authentic, and remarkable examples. Standard phrases, idioms, and cultural elements are provided with the commentaries and examples that you cannot find in dictionaries. The website is being created by native speakers of Russian. You can use all the learning materials on this website for your self-study for free. We will make colloquial speech sound for you the way it sounds for a native speaker. And if you make an effort, you will be able to speak the language like Russians really speak it. First of all, Rus4me is an original methodology. We analyse modern colloquial speech and choose the most important, authentic, and remarkable examples. These samples of real colloquial speech that we use, cannot be found in textbooks. Standard phrases, idioms, and cultural elements are provided with commentaries and examples that you cannot find in dictionaries. The website is being created by native speakers of Russian. Why do I need Rus4me? Together with Rus4me you will improve your listening skills and enlarge your vocabulary. To some extent Rus4me can replace a native speaker teacher. If you think that knowing idioms and cultural elements is as important as knowing grammar, then this website is for you. You can use all the learning materials on this website for your self-study for free. You do not need flash-plugin to watch the videos on the website since all the videos are published in the modern advanced webm format. This means you can work with the learning material on any mobile devices. The design of the website is adaptive, so you can successfully use it on both desktop and mobile devices. If you like this website, place this banner at your blog or website page.